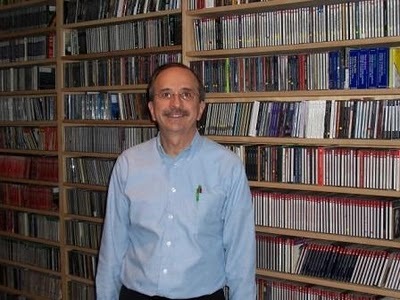 Michael Dolan, the host of Wednesday Evening Classics, is the newest Classical Music announcer for WWUH, starting on the air in August, 2007. His connection with the station started three years ago, when he moved to Hartford. At first, he was just a listener, but when WWUH asked for volunteers, he decided to help out. He did not expect to become an announcer, but the training included studio work. Michael made his demo tape and when an opening came up, he was on the air. Michael was born and raised in Philadelphia. He grew up singing in the church choir. His first real exposure to Classical music came in high school. A girl he was dating persuaded him to go to the opera. He saw Carmen and La Boheme with singers like Mirella Freni. It was a great introduction to classical music. It was in college that he first seriously studied Classical Music, first with a two semester History of Music course. He later studied Medieval and Renaissance music, leading him to long term interest in early music, influencing his programming of Wednesday Evening Classics. While in college, he also began to attend Philadelphia Orchestra concerts. He got last minute student tickets, which were in the last two rows of the highest balcony of the Academy of Music. The orchestra was far away, but the sound was great. Later, after Michael started his actuarial career, he bought a Thursday evening subscription to the Orchestra in a much closer location. Later on, his career took him to Florida, where he was a subscriber to the now defunct Florida Philharmonic. He continued to sing with his church choir. Michael's musical tastes cover a variety of styles and periods. His favorite composers are Mozart and Schumann.